It was one more of the little dinner parties I have - just a few friends, and a completely home-cooked meal. Since one of my guests was a friend from Australia who misses Bengali food a lot, I was cooking a Bengali meal in her honour. I planned to make the entire elaborate traditional meal right from the bhaja, teto (bitter element) daal, through fish, chatney, and a finale of mangsho'r jhol. However we're having sickeningly hot weather and the hubby cautioned me to pare down the menu as no one would actually enjoy the full spread in this awful weather. That did make sense and I edited my menu severely by removing the little fiddly elements like the bhatey (mashed vegetable) and bhaja (fried accompaniment with daal), and even the vegetable course I had planned. The final menu had a simple daal, plain white rice, a prawn course, mangsho'r jhol (goat curry) and kaancha aam'er chatney, followed by gur'er paayesh for dessert. 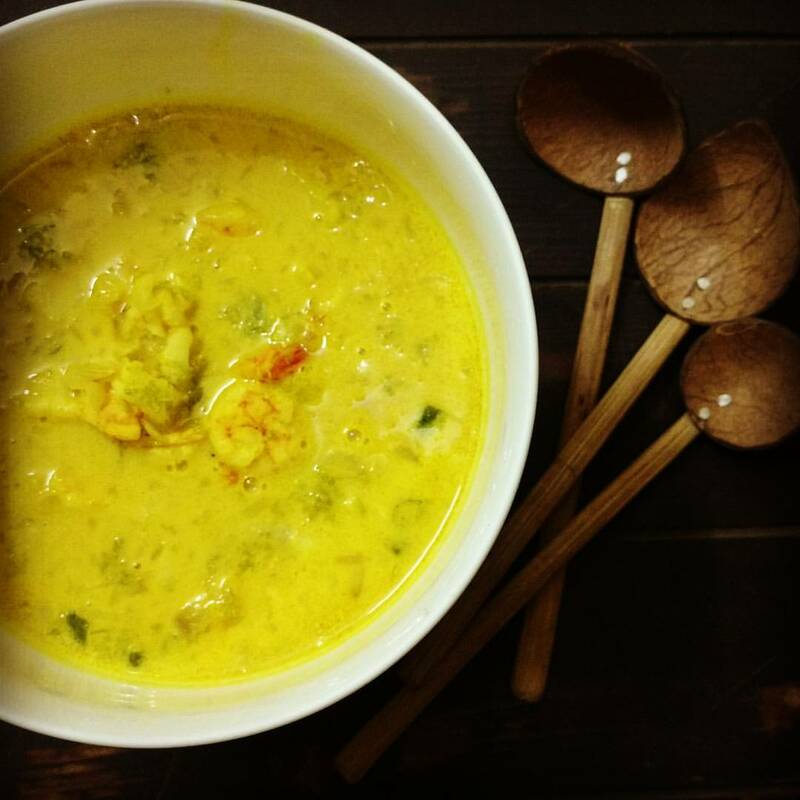 I started out with a plan to make Daab Chingri, a well known Bengali classic, with the prawns. I happened to have loads of daab (tender coconuts) at home and it had been a while since I'd made daab chingri. As it happens with me a lot, though I planned a tried and tested and guaranteed to be great dish, something kept me hesitating, not a 100% convinced. I checked countless recipes online and dithered away, or simply cooked the other things on my menu. And then it was evening and my guests would be arriving in a little more than an hour! I hadn't made any progress with my daab chingri. And then I had an idea. The daab chingri was abandoned but not entirely. I was in the mood to fool around and I had, what I thought would be a brilliant dish in my mind. But I did have guests to feed - so taking no chances I had a quick confer with the hubby and I was back in the kitchen ready to make Daab'er Shaansh ar Gondhoraaj Lebu diye Chingri. Shell and devein the prawns. You can leave the heads on if you like, I don't because the hubby is allergic to the shell. Marinate the washed and drained prawns in salt and turmeric. In a wok heat the mustard oil. Once it's hot reduce the flame and chuck in the finely chopped onions and the minced green chillies. Fry slowly taking care not to brown the onions at all. Smash the ginger into a rough paste in your mortar and pestle. Use fresh ginger instead of store bought paste - the flavour is significantly better. Add it to the frying onions. After a minute or so add the prawns. Stir well and cook over a medium flame till the prawns turn just opaque. Now add the coconut flesh and the coconut water. Bring it to a boil and add the coconut cream. You can use half a cup of thickly made coconut milk using a commercial coconut powder if you don't have coconut cream. Mix well. Let it all simmer till the prawns are cooked. Don't over cook your prawns! Switch off the flame and then sprinkle the Gondhoraaj zest over the curry. Cover the pot and let it infuse for 5 minutes. Serve with plain hot rice.